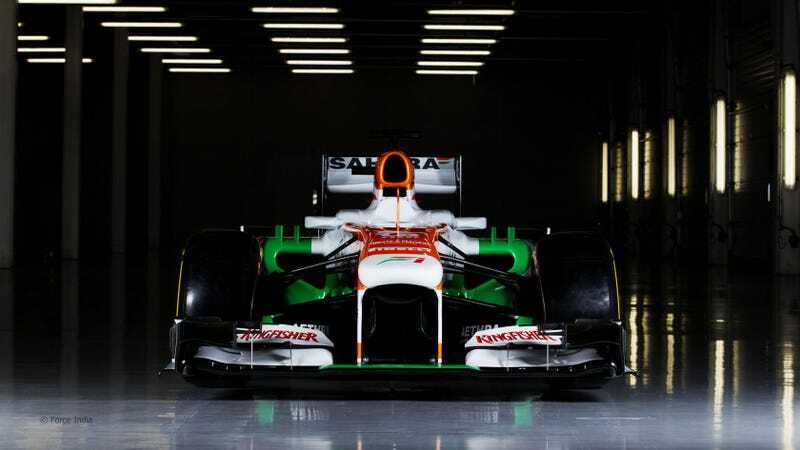 As far as I can tell, the Sahara Force India team is only in F1 to show the world what a superpower India has become. Sure, all Formula 1 cars are full of sponsor logos and product placement, but beyond a few foreign (mostly British) supporters, the main aspects of the car remain very Indian. And this Asian country wants to score just as much as ever. The new VJM06 might be able to help with that. They pretty much stopped the development of the previous car mid-season last year so they could come up with this one. According to technical director Andrew Green, "gains are harder and harder to find due to the regulation stability, so we couldn't hold back. We had to redesign everything to maximise the potential of the car." So they did. Hopes are high, while shareholders expect to see more podium finishes like the one Giancarlo Fisichella gave the team after coming in second in the 2009 Belgian Grand Prix. That pressure lands on Paul di Resta, while we are still waiting to see who is going to become his teammate in 2013. Jules Bianchi and Adrian Sutil are both running for the seat. Their wallets will decide.